This Reindeer is available with or without a name written on the foot. This item can be customised with your choice of paint colours and glitter colours. The sides and back of this item are painted. Glitter is on the front of the item for the nose and on the front, sides and back of the antlers. 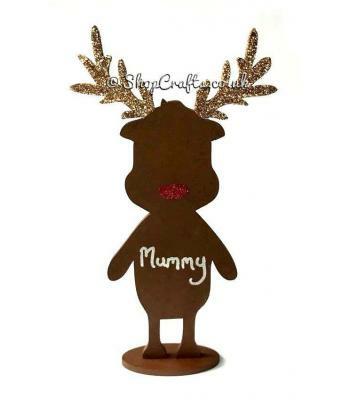 The reindeer is approximately 130mm (13cm) by 250mm (25cm) and is made of 18mm thickness mdf. This item does not come with the chocolate kinder egg. I have more personalised and Christmas items available.